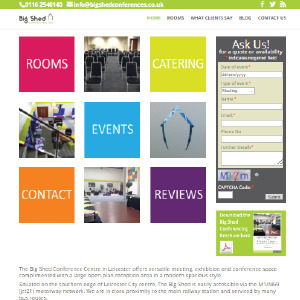 Big Shed Conferences one of Leicester’s leading venues for conferences, training events and specialist meetings. They came to us to rebuild their existing website since it wasn’t fully featured and was very difficult to manage. It also wasn’t very mobile-friendly. The key thing that they wanted to get across is that their facilities are light and spacious which lend themselves to big gatherings of up to 300 people. One key feature was to make it easy for site visitors to get in touch or enquire about a meeting space through the use of an enquiry form on all the main pages. The site also has a blog, and social media integration as well as a data capture facility.